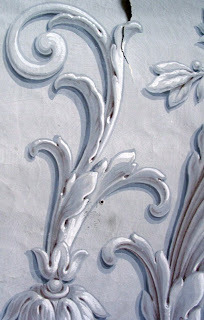 These are some of the nicest examples I have of grisaille ornamentation. 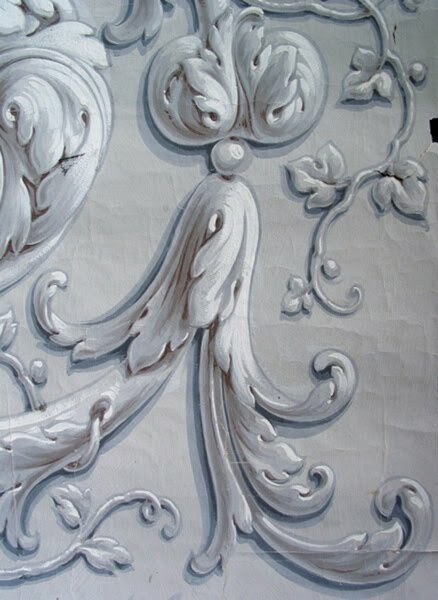 The artist has convincingly created a trompe l'oeil effect with the most economic of means. The body of the ornament has only four colors, laid in the order of medium tone first, then dark medium, darkest shadows, and lastly some high lights. It's always important to be careful with the lightest lights: it's very easy to make ornament look as though it's been dusted with snow. 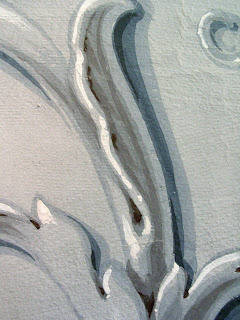 The artist then laid in a medium blue background shadow to raise the ornament from the canvas, followed by subtle use of a darker blue. It's so convincing that it's easy to miss just how economic she has been: 80% of this ornament has been laid in in just one color, the light blue grey. Very nice- have you seen the grisaille from the Vatican hallways? Amazing. I should start some Flickr uploads myself.